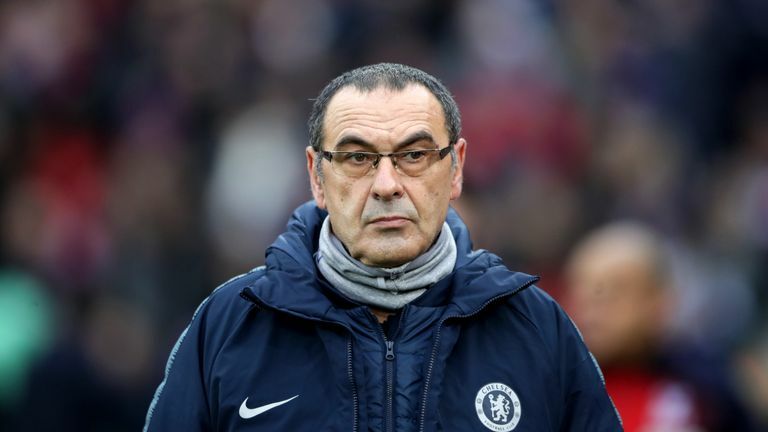 Maurizio Sarri has reiterated his belief that Manchester City are the best team in Europe ahead of Chelsea's trip to the Etihad Stadium, live on Sky Sports. Pep Guardiola's side only returned to the top of the Premier League table on Wednesday, following their win at Everton, after trailing Liverpool for several weeks. However, Sarri's admiration of Guardiola's team has not dimmed, and he said: "At the moment, in my opinion, Manchester City is the best team in Europe. "Guardiola is in the third season in the Premier League. We have to try to reduce the gap." Guardiola has previously said he believes Sarri's side are capable of winning the title, but the Italian is not so sure. "At the moment, I don't think so," said Sarri. "We will be able to fight for the top four in this season. No more, I think. "We can win something, of course, but in the Premier League there is a fight between Liverpool and Manchester City." Chelsea's victory over City in December came courtesy of a goal from N'Golo Kante on the stroke of half-time, and a late David Luiz header. "I think we were lucky because we scored in a very difficult moment of the match," said Sarri. "Maybe we deserved to win in the second half, but we were lucky in the first half. "In that match we defended very well, because they had only three goal opportunities. It's not easy against Manchester City to give them only three opportunities. "We need to defend very well and to be very fast when we recover the ball. They are able to press really very well. If we do it, I think we can find spaces. But it's very difficult."